Here below are some examples of covers we have in stock, but we also deal with specific queries for tailor made covers. For example we can also supply all these covers below for the 640L or 820L IBC containers. Standard IBC cover: This cover is ideal for places where fume risks exist. 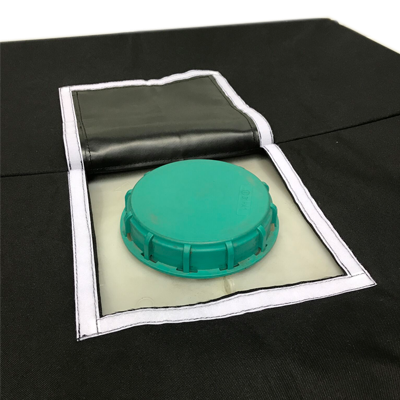 We have this cover in two sizes, either to just put it over the IBC itself or to have it over an IBC which is placed on a bund. It’s made from chemical resistant heavy duty, weather-proof, lacquered PVC. Insulated IBC cover: This cover is ideal for during transport. The outer skins is made of C-L polyethylene or PVCN and infilled with thermal. Perfect to protect your product against frost. Weaterproof and insulated IBC cover: With insulated lining and PVC weatherproof material, this cover can be perfectly used for outdoor storage. Heated IBC jacket – fixed up to 40 degrees: If your product needs a stable temperature, this cover is what you need. It can be fixed at stable temperature with a non-variable heat control. Depending on the product in the IBC the temperature goes up 1.5 degrees per hour until it reaches the set temperature. Heated IBC Jacket – frost protection: this is a similar jacket, but automatically starts warming up when the thermostat drops to low temperatures. It doesn’t heat more than 5 degrees Celsius, but it will protect your goods from frost. UV protection cover: Made from 600 denier bag cloth and therefore extremely durable, resistant and easy to handle. It protects your tank from UV-radiation and for example it outdoor water tanks from algae.